Community Withdrawal Support Service (CWSS) is a set of services that offers an alternative to residential withdrawal management for individuals who can safely withdraw from alcohol and/or other drugs in a safe and supportive community environment. CWSS staff will also facilitate collaboration with other service providers who are supporting an individual to withdraw. Services also include consultation and capacity-building to referring agencies as well as primary care providers. Services are voluntary and are provided to individuals 18 years of age and older in Guelph, Cambridge, Kitchener-Waterloo and rural Wellington. If you require further information, have questions, or would like to access CWSS, please contact the service directly by calling toll free: (1-844) 722-2977. 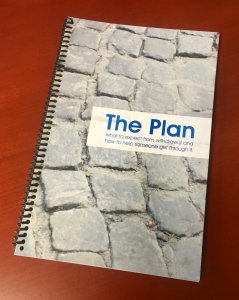 A key enabling component of our Community Withdrawal Support Service is a 54-page resource booklet called ‘The Plan’. The Stonehenge team developed this resource specifically for this program. The Plan is an essential resource for individuals going through withdrawal, their family/friend supports, and the professionals involved in their care. The Plan outlines information on what to expect when going through withdrawal with detailed information for specific substances. It highlights information on post-acute withdrawal symptoms, relapse prevention, and available resources to help support individuals once acute withdrawal is complete. There is also a specific section designed for family and friends that provides resources on how to support a loved one and take care of oneself during this time. The Plan is an informative reference for anyone supporting someone with an addiction. Because there is nothing like this resource elsewhere, we’re also making it available to other health service providers. We are providing it at cost ($10) plus shipping, or you can pick up directly from our Guelph office. If you would like to obtain copies of The Plan, please go to our Merchandise page. Stonehenge has also created specially-designed Withdrawal Kits. 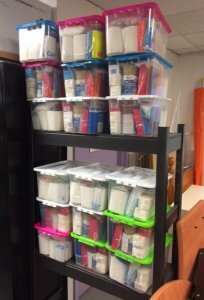 The kits come in re-sealable bins or backpacks and provide an array of support resources for someone going through withdrawal. Items include food items, hot/cold packs, wipes, information and much more. 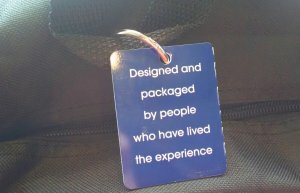 The contents of the kits were chosen by people with lived experience, in other words, people who know exactly what to include. They even volunteered and helped pack the kits.